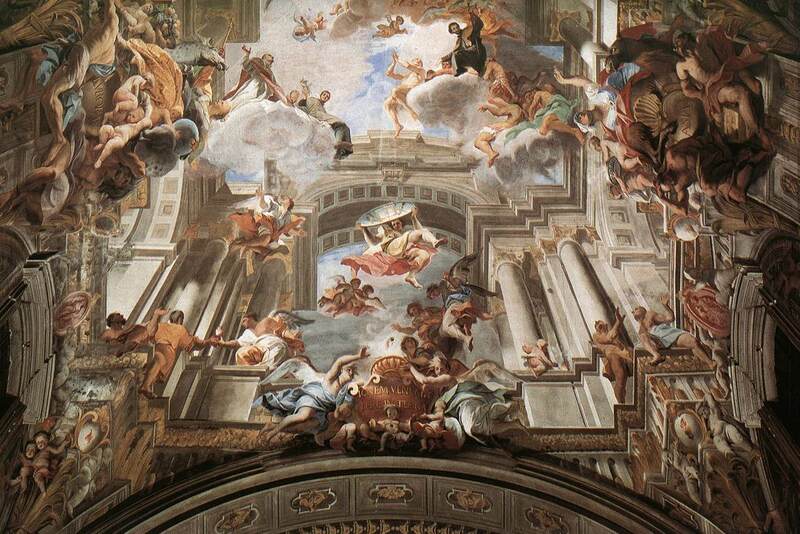 Andrea Pozzo was an extraordinarily versatile artist, an architect, decorator, painter, art theoretician, one of the most significant figures of Baroque Gesamtkunst. 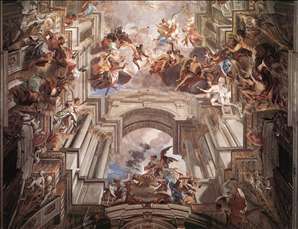 He entered the Jesuit order at an early age, and his artistic activity is also related to the order s enormous artistic enterprises. 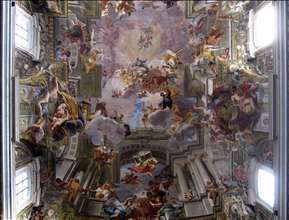 His masterpiece, the decoration of Rome s Jesuit churches Il Gesu and Sant Ignazio, determined for several generations the style of internal decoration of Late Baroque churches in almost all Europe. 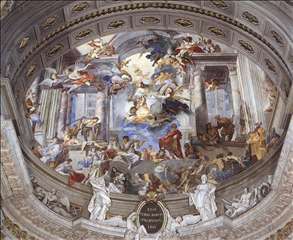 His fresco in Sant Ignazio, with its perspective, space-enlarging illusory architecture and with the apparition of the heavenly assembly whirling above, offered an example which was copied in several Italian, Austrian and German churches of the Jesuit order. Pozzo even published his artistic ideas in a noted theoretical work entitled Perspectiva pictorum et architectorum (1693, 1698) illustrated with engravings. 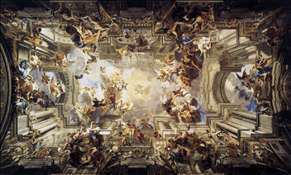 On the invitation of Emperor Leopold I, in 1704 be moved to Vienna, where he worked for the sovereign, the court, Prince Johann Adam von Liechtenstein, various religious orders and churches. Some of his tasks were of a decorative, occasional character (church and theatre scenery), and these were soon destroyed. 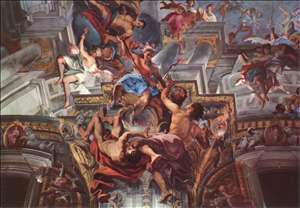 His most significant surviving work in Vienna is the monumental ceiling fresco of Liechtenstein Palace. 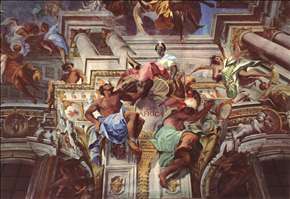 The Triumph of Hercules, which, according to the sources, was very admired by contemporaries. 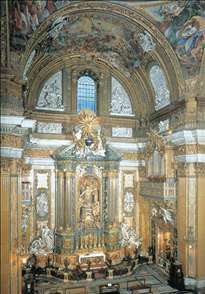 Some of his Viennese altarpieces have also survived (Vienna s Jesuit church. 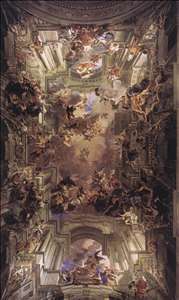 His compositions of altarpieces and illusory ceiling frescoes had many followers in Hungary, Bohemia, Moravia, and even in Poland. 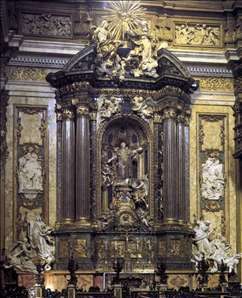 See more details about "Altar of St Ignatius Loyola"
See more details about "Allegory of the Jesuits' Missionary Work"
See more details about "Allegory of the Jesuits' Missionary Work "